I've been on the hunt for a glass water bottle. I've had a few plastic ones in the past and they were fine, but they seem to get slimy and water just doesn't taste as good out of plastic. Plus, the whole chemicals leaking into water stuff got me really nervous. On top of being glass, I wanted the bottle to look good, since I take it with me everywhere (it's an accessory), and I wanted it to have some kind of rubber sleeve to prevent it from breaking. Here are my top 3 glass water bottles. Click images for source. 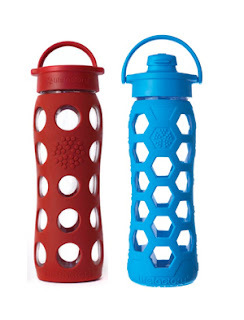 These BKR bottles are beautiful, but the mouth of the bottle is very small. In my opinion that makes it hard to drink out of. They also donate a portion of your purchase to clean water initiatives. They are 16oz and they retail at $28. "What happens in one part of the earth affects all of it. When you buy a bkr we'll invest a portion in initiatives that combat the global water crisis and bring clean water to people who don't have it." Takeya also makes some beautiful water bottles. The mouth of the bottle is much larger and they come in four sizes. They range in price from $17.99 - $19.99 and they come in a wide range of colors. 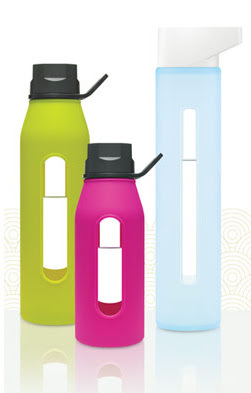 Lifefactory bottles come in a variety colors and styles. They even make sippy cups and baby bottles! They have very wide mouths; it's like drinking out of a cup instead of a bottle. Their 22oz bottles are $24.99.